Patterns are one of the most fundamental ingredients of music and so students with a solid pattern vocabulary will be much better as both readers and players. If you haven’t explored left hand piano styles and patterns before, your students may not understand what you mean and how important they are, so one of the best ways of helping students understand the importance of left hand patterns is with a practical exercise. Depending on the level of your student, s/he could play the chords while you play the patterns or vice versa. It’s amazing how often subtle differences in left hand accompaniment completely changes the feel and style of a piece of music. That’s exactly why left hand patterns are so important and why I created a download especially to help teachers explore this with students. To make exploring these patterns in your studio that much easier, I’ve created a download of the most common patterns that students should know. All patterns are written in major. They can easily be adapted to suit a minor key by lowering the 3rd. All patterns are written in C Major. Encourage students to transpose to other key areas (this is easy to do if they apply these patterns to lead sheets and chord progressions). All patterns are notated for a bar of 4/4 but can easily be adapted to suit other common times and students should be encouraged to explore them in other meters. Patterns are notated in the most sensible format for 4/4 however, they may be elongated or shortened (eg. change quaver (eighth) pulse to crotchets (quarter) pulse) depending on the time signature. 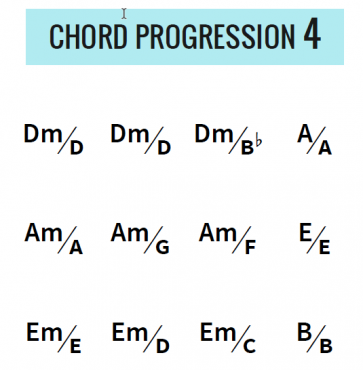 If you want a simple chord progression to practice these, use the Pachelbel Progression in C: C – G – Am – Em – F – C – F – G – C or any common pop song progression, eg. C – Am – F – G or C – G – Am – F or get students to make up their own using the common chords in the key of C major (C, Dm, Em, F, G, Am). Patterns are written as “continuous patterns” that flow continuously through the music. Many of these patterns can also be played in a “discontinuous” form, which is often more effective (see my note about repetition below). Here is an example of a discontinuous version of the common “pop style”. Make sure students know that the patterns don’t have to be continuous all the time. This is not meant to be an exhaustive list of all the possible styles. Rather, I’ve just included the most common that I come across and that I feel are important for students to explore. 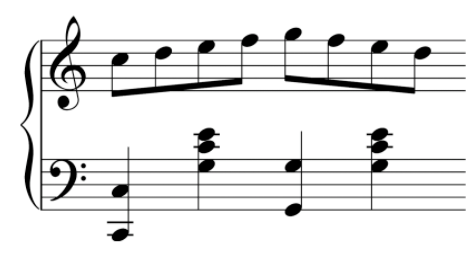 These also tend to be the patterns and styles that are most common in the piano literature. Feel free to vary these patterns; composers will rarely stick to just one for long. Students can: change styles, go from discontinuous to continuous or vice versa, etc. Each lesson you could explore a new pattern in the context of a simple lead sheet or chord progression. Students can use these patterns as a basis for basic improvising on a chord progression. If you’re about to introduce a student to a piece of music that uses one of these patterns, then introduce the pattern – how it looks, sounds and feels to play in a variety of positions – well before they see the music. Get them to try playing the pattern over a simple chord progression (eg. C, Am, F, G) and writing it out in each position. When you come to learn the music, ask them if they can spot anything familiar in the LH?! Make sure you help students understand that there will always need to be a balance between the melody (RH) and the accompaniment (LH). This can be hard to achieve, so I wrote about one of my tactics in this post: Using Ghosting to Balance the Hands. This can be a great activity to use in conjunction with pattern work. It’s worth noting that while patterns do help give us a feel and style of a piece of music, the same patterns aren’t designed to be continuously repeated bar after bar. It all depends on the context of the music and what’s happening in the melody. Of course, you wouldn’t likely want to mix a tango pattern with a boogie (unless you were aiming for a particular effect) as that would change the style of the piece completely. Just help students keep in mind that while left hand patterns are important for building atmosphere and style, the melody should always be the most important feature of the music. One of the best ways of exploring these patterns is to use them in chord progressions. Earlier this week, I released a post called What’s the Difference Between a Chord Chart and a Lead Sheet. In that post, I offered you a free download of my Chord Progressions to Inspire Creativity and show you a video of how I teach them. Here’s a quick example of one of the progressions. Click it to download and watch the video. I’ll soon be releasing my training course all about teaching chords and non-jazz (pop-style) improvising and composing to students. It’s one of the features of my teaching that other teachers are most inspired by and I’m really looking forward to sharing this with you in the next couple of months. As long as you’re on my email list (there is a subscribe option at the bottom of every page), you’ll find out when it goes live. Deas, S. (2007). Improvisation for Classically Trained Musicians. Petersham North, NSW: Susan Deas Music.